As Museum Preparator, I often install framed paintings, prints, or singular-element sculptures such as marble busts or bronze figures. 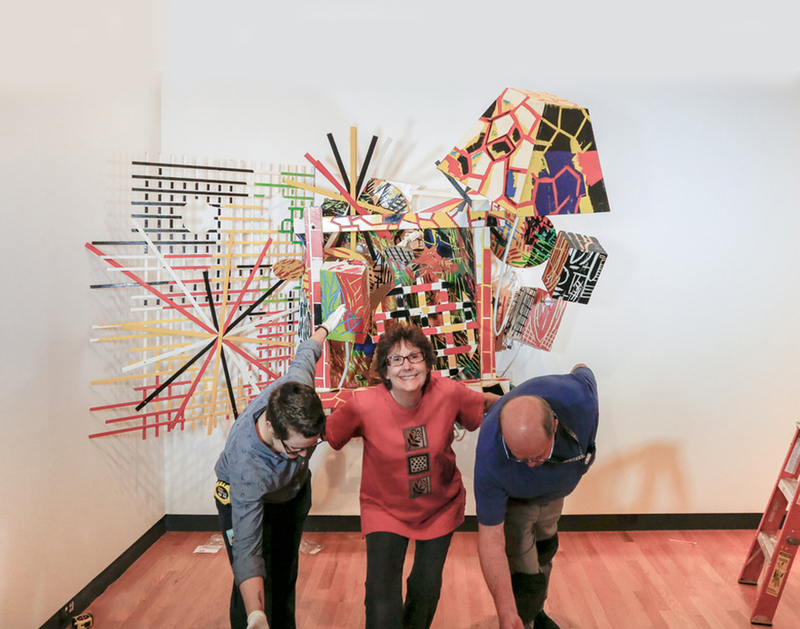 But it is a wonderful rarity to construct an artwork with as many components as Judy Pfaff’s Wallabout, a task I undertook with colleagues Bob Riddle and Linda Best in August. The work is currently on view as part of the exhibition betwixt: Judy Pfaff 1985/92. 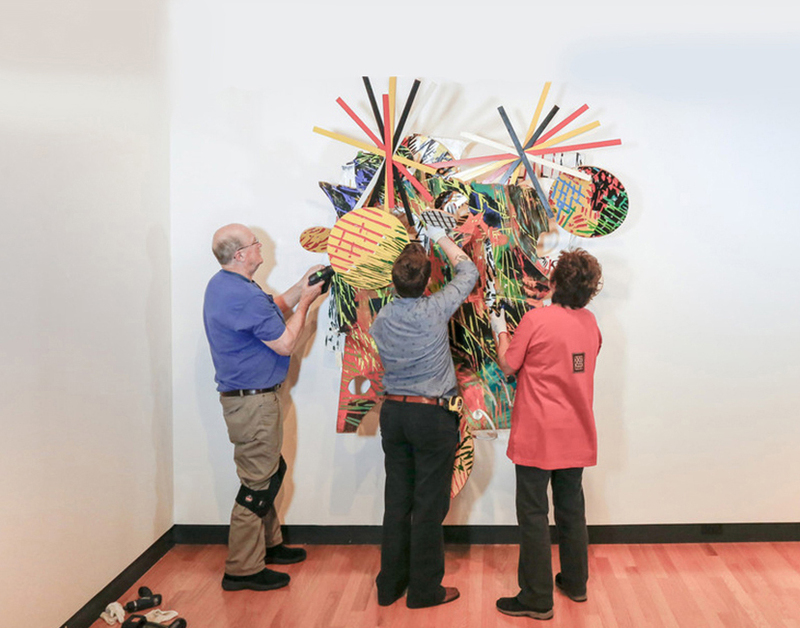 Installing a work as layered as Wallabout was a daunting undertaking at first. Pfaff’s creative process was highly organic, while a preparator’s process has to be exact, deliberate, and focused on recreating the artist's vision for the work. When the combined structural elements are isolated into singular components, an order becomes evident. It is much like building a house; start with a foundation, then construct the frame, add a roof, etc. The final product makes the strenuous process worthwhile. When a museum acquires a multi-component artwork such as this, there is no instruction manual and templates are often only made after the fact to aid in future installations. Careful and thoughtful handling of the work is necessary to preserve the sculpture for future generations. 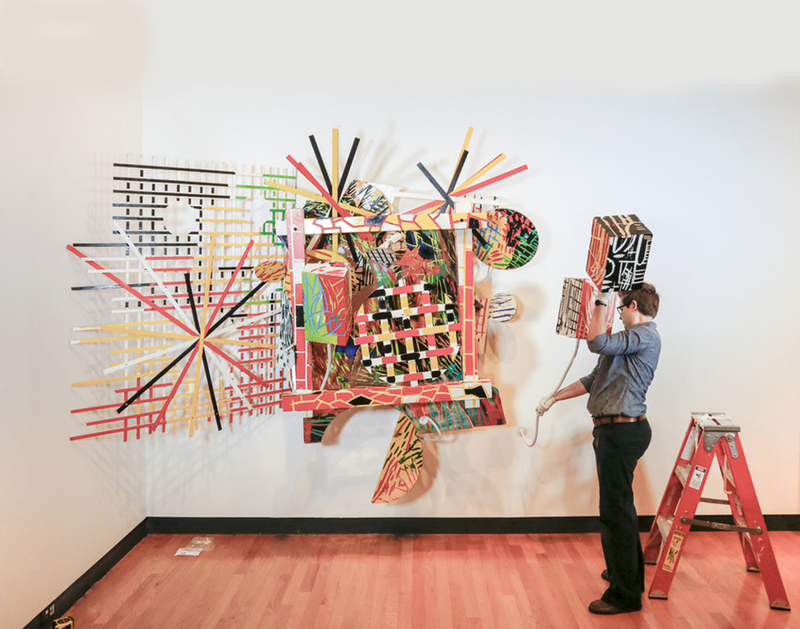 If the order in which the pieces are reassembled is changed, or the elements themselves are altered during the installation, all the pieces may not continue to fit together, thus impacting the artist’s intent. 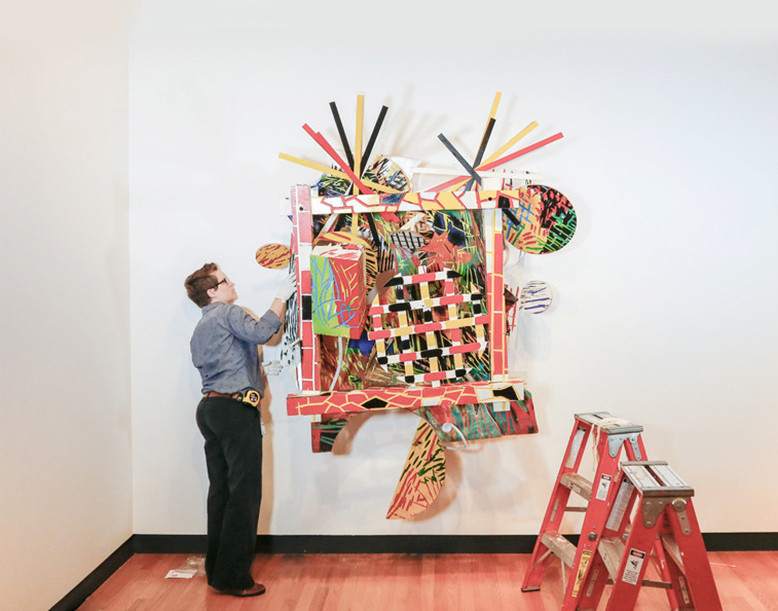 A time lapse video, created by our Digitization Specialist Laura Shea, helps to illustrate the meticulous, physically challenging process of installing Pfaff’s intricate and layered work. Constructing the sculpture layer by layer gives insight into Pfaff’s decisions and process-- how she navigated line, shape, space, and color. 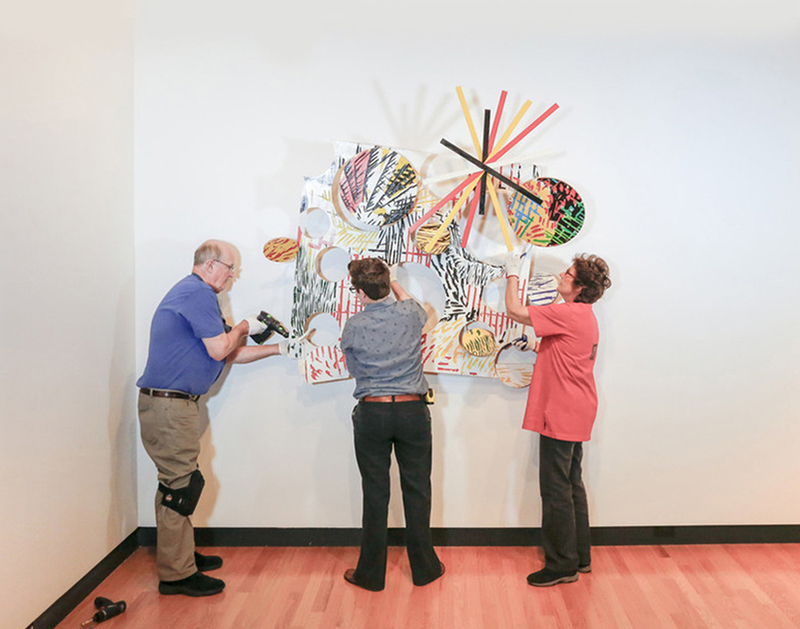 Judy Pfaff Wallabout Time Lapse from MHC Art Museum on Vimeo. Although the installation process requires concentrated precision, the more difficult aspect of sculptural artworks such as Pfaff’s is the storage of these components. At this stage of care I wish I could enact a levitation spell to simply relocate the artwork without touching it! Alas, each part must be disassembled and provided with a custom storage solution geared toward preserving the surface as well as the curves and angles it holds while installed. Engaging with an artwork in this fashion is invigorating and filled with problem-solving opportunities that keep collections managers and preparators on their toes. We are perpetually evolving procedures and methods of care to maintain the safety and integrity of fantastically complex works of art.